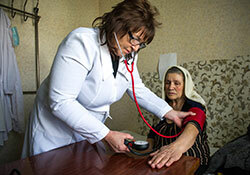 In conflict-affected areas of Ukraine, health systems and workforce are heavily disrupted. WHO and partners have been delivering essential health services to people in these areas through mobile emergency primary health care units and emergency primary health care posts. The humanitarian crisis in Ukraine has affected 4.4 million people and led to the displacement of 1.6 million. Of those affected, 3.4 million are currently in need of humanitarian assistance. Access to primary, secondary and emergency health-care services and medicines has been disrupted on both sides of the contact line. A key factor in the disruption of health services is the shelling of health facilities. Since the start of the conflict, at least 160 health facilities have been targeted on both sides of the contact line; 130 of these have still not fully resumed operations. Lack of qualified medical staff as well as shortages in supplies and equipment limit access to health care, particularly in areas close to the contact line. Over 400 health facilities report insufficient stocks of supplies and basic medicines such as insulin and treatments for kidney failure. Continued difficulties in accessing conflict-affected areas of eastern Ukraine, particularly in non-government controlled areas (NGCA), further hamper the ability of WHO and health partners to deliver critical health services to those most in need. lack of access to mental health and rehabilitation care. In 2017, one third of the funds requested by WHO in the 2017 Ukraine Humanitarian Response Plan was unmet. In 2016, only 15% of the total funding requested for the health sector by WHO and other health partners was received. WHO therefore urges the international community to mobilize and provide more health aid to address the humanitarian crisis in eastern Ukraine. While WHO continues its response to this health emergency, it is also looking ahead by building recovery and sustainability initiatives into its activities.